What exactly do we think we’re doing when we back a Kickstarter project? While most of the tech industry was trying to fathom why Facebook (s fb) would pay $2 billion for virtual-reality headset maker Oculus VR after the acquisition was announced, many of the 10,000 would-be users who backed the company on Kickstarter were busy slamming the company for selling out — despite the fact that Oculus had already sold out by raising venture capital, as founder Palmer Luckey noted in a comment to the Wall Street Journal. More than anything, what this furor highlighted is the emotional connection that many backers seem to feel when they fund a Kickstarter project: something that has very little to do with any legal rights they may have to the thing they back, but a connection that is still extremely powerful. In some ways, it may be the most powerful feature that Kickstarter or any other crowdfunding platform has. As more than one observer pointed out in the wake of the announcement, Kickstarter backers don’t actually get any right to share in the idea or business venture they are helping to fund. In other words, they don’t get any equity rights, the way a venture capitalist would if they put up money to start a company. Kickstarter is quite clear about telling users that they get access to the specific rewards that a project offers on its Kickstarter page, and nothing else — and even those shouldn’t be counted on because they aren’t guaranteed. I'm sorry, but why is it that Kickstarter backers believe they're owed anything beyond what they were promised? Mike Masnick of Techdirt said the Oculus uproar reminded him of when The Huffington Post (or YouTube) was sold and some users demanded their share of the acquisition price because they helped build the business. In a post at Bloomberg View, financial analyst Barry Ritholtz suggested that the Oculus backers were suckers for putting up money in return for T-shirts and/or developer versions of the device. “Talking people out of $2.4 million dollars in exchange for zero percent equity is a perfectly legal scam,” he said. On Twitter, someone said the reaction to the Oculus acquisition was a little like what happens when an indie band sells out and either gets a big record contract or has their iconic song appear in a commercial for something mundane. There’s no question that Facebook is distrusted among many of the geeks and nerds who made up the Oculus funding group. When it comes right down to it, this is what Kickstarter or any similar platform — and all of the entrepreneurs or artists who use them — are selling: the feeling that without you and your $10 or $50, this magical or amazing thing wouldn’t happen. It’s like donating to a family who has special needs or contributing to life-saving surgery for a child. And the personal connection to the project is a big part of that magic, which is what makes it so interesting when it’s applied to journalism, as it is through platforms like Beacon and Contributoria. But that personal, emotional connection is also why Kickstarter gets grief when it is used by celebrities like Zach Braff or the person using it for something worthwhile turns out to not be what they seemed — or even when the money is used in ways that backers disagree with, which is part of the reason that musician Amanda Palmer got flak during her crowdsourcing campaign for a new album, after raising more than $1 million in a matter of weeks. I think that’s why Palmer Luckey spent so much time responding in the sub-Reddit and elsewhere: because he recognized the personal and emotional commitment that his backers made, even if they don’t have any legal right to share in the proceeds of his windfall. And he probably knew that without them, he might never have gotten to that point in the first place. It’s Kickstarter ! The purpose of these projects is to bring product to market and be successful. Are people under the presumption that these projects are created to make the world a better place?. Lol. It’s all about the money. I have contributed (NOTE -Given!) through Kickstarter because I believed the project was worthwhile, not for any other reason, as I donate to ANY charitable cause. The fact that I may receive some kind of premium or benefit is “icing” on the proverbial cake. If you have a profit on your “gift” in mind, you are foolish. I assumed it was common knowledge that you contributed to a KickStarter to fund a project that a larger company wouldn’t deem worth funding. The recent Veronica Marrs movie is a great example: backers are able to see the plot line carried out, but aren’t expecting a portion of the profit. This concept of accusing people of “selling out” is really hard for me to understand. Do you really think anyone has the time and resources to do anything “anarchy style”? Just like how you, yes YOU, will quit your job if given 5 million dollars is the same way anyone in their right mind will sell their small company when given a hefty offer like that. Let’s face it, both you and I would happily “sell out” if it means we don’t have to set foot in some grimy office again. Good point. People who gripe about others “selling out” are generally just jealous they aren’t getting the opportunity to “sell out,” themselves. “Itâ€™s like donating to a family who has special needs or contributing to life-saving surgery for a child” — no… no it is not. People across the globe donated their hard earned money to give a kick start for an incredible idea. People may feel cheated by Oculus buyout but it could be good for the project. Facebook buys Oculus VR which is good for the project and we may get better devices with advanced features. I need your suggestions guys. I am going to start an Education website ( http://careervendor.com/ ) that will cover various courses up to graduation. Can I get donations for this project from Kickstarter. 2 billion is way too much for what is basically a very good marketing name ‘Oculus Rift’; the technology will be easily copied – Sony are working on their own version are they not.. I’d buy that but I’d never buy anything with a Facebook logo on it! FB will ruin what could have been a very good piece of tech. Do you have any data to support your claim that many people besides the one person you cite and the one person the New York Times cites believes this? While I am sure that there are more people who are this foolish, there should not be many more. Kickstarter is very clear “yYu get what you were promised but you might not even get that, and if you do not it is not Kickstarters problem.” With all those clearly stated limits expecting more is beyond bizarre. There are many projects that raise mere thousands of dollars and the creators underestimate the costs, end up losing money and delivering late. In those cases the backers frequently post irate messages that they’re disappointed their purchase experience isn’t turning out how they expected. No matter what, people will complain. Really? It’s just reality, virtual or otherwise and will hardly stop or slow the rush to make it difficult to tell one from the other. Actually, that people would think they have a basis to react this way, says something about how far down that road they already are. At some point, it would be nice for the social contract here to be somewhat legally enforced, at least in some small way. Except they did get a product. The original oculus backers got exactly what they were promised: a VR Dev kit (not to mention it was the best one ever created up to that point). Wouldn’t it be nice to be so ignorant about how business works in the US? Long term ,for FB this is about the OS for glasses in general, they are skipping phones and trying to get solid share there. It is funny how the Oculus guy just lies about it on Reddit saying it won’t be tied to FB while at the same time FB is saying this is about services.Oculus might get 2-3 gens that are not fully crippled by FB but that’s it and we all know it. Ofc what you are saying is mostly true but you are underestimating how hated FB is. Most would be ok with a sale to pretty much anyone else but with FB it’s almost certain that it will ruin it and that’s the biggest problem. In the end people are upset because they see no possibility for a positive outcome and they say all kind of things that they believe are valid arguments. And Kickstarter says up front, in nicer words, that they don’t want your kind. Your kind always seems to creep in where people have explicitly said you’re not wanted, to do the smallest “favor” you can hide in the crowd, to go back later and try to see if people who owe you nothing are suckers enough to buy into your guilt trip. There’s two basic kinds of informal “economy.” There’s the “owe a favor” kind, where everybody keeps count, and then there’s the “be a neighbor” kind where they don’t. “Be a neighbor” people aren’t running a scam. It _works_, where it’s a shared norm in a community of people. But even when “be a neighbor” communities say they do not want “owe a favor” types to be part of their mutual network, you always have “owe a favor” types sneaking under the door, doing something very, very small, and then wanting A LOT back later from everyone in the “neighbor” communities that does well. When you contribute to a kickstarter project, the people making the cool thing do not owe you anything. If you want people starting a business to owe you something, buy equity—that’s the transaction where someone owes you if it pans out. But, like hiring a prostitute, it costs more. Unsolicited guilt-peddlers are a dime a dozen—and overpriced at that. 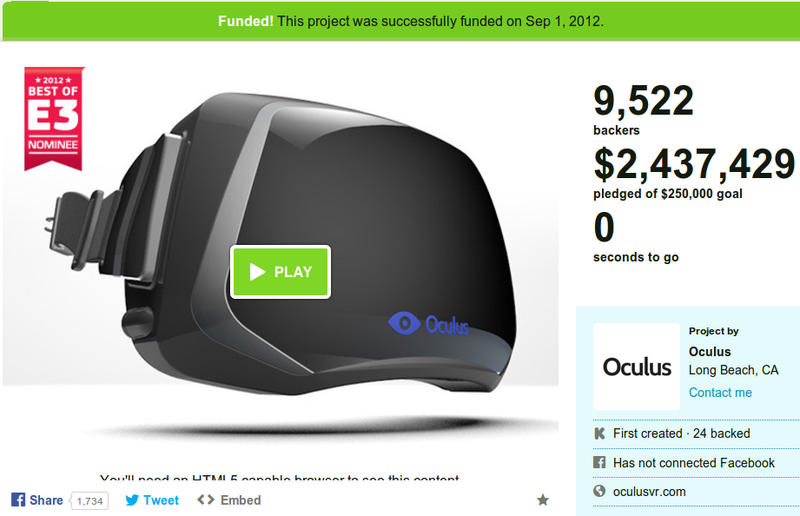 A simple solution for the Oculus founders is to reward each of the 9,522 contributors with a reasonable financial reward. With 2 billion in the pocket they could easily set aside 10-15 million and show gratitude towards those who funded the idea. Look at the great publicity for the company and indirectly the Kickstarter community at large. It always looks bad when you have to defend your actions ( perfectly correct) but generous rewards to those who care the most will far exceed the initial cost to the founders. Those guys that complain now would still complain that $1000-$1500 is too low compensation. No matter what Oculus founders do they could not “win”. Agree, people greedy and will not be satisfied. I agree with this. It’s not like they couldn’t find these folks, there’s a list of every dime invested. And as a simple thank you, it would be a good and I believe appropriate gesture to share some wealth. It’s no different than if someone takes up a collection at a party, and parlays that into something big, the least you can do is pop back into the party and buy a few rounds of beers for everyone. C’mon, they just made billions.